Holiday Disguise, a 5-year-old Harlan's Holiday mare also owned by Lady Shelia Stable, will look to rebound off a sixth-place finish last out in the Iroquois Oct. 20 at Belmont Park. 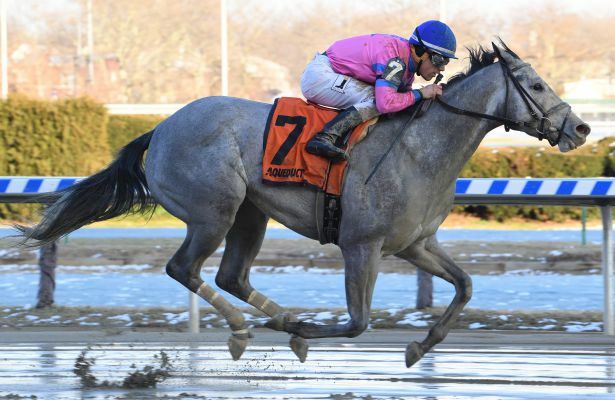 She has three wins from four starts at the Big A, along with a second-place finish. Trainer Kiaran McLaughlin will send out Pauseforthecause, for owners Chester and Mary Broman. A 4-year-old Giant's Causeway homebred, she has two wins in her last four starts, and will look to rebound off a third-place effort in the La Verdad on Jan. 5. Filibustin, for owner Susan Moulton and trainer Gary Contessa, enters the Broadway off a 4 ½-length optional-claiming win on Feb. 1 in her first start for her new conditioner. Previously, the 5-year-old Bustin Stones mare finished fourth in the Iroquois, but is 2-for-2 at Aqueduct, with a formidable three wins and three second-place finishes from 10 starts at the distance. First post time on Saturday's nine-race card is 12:50 p.m. ET.